We have been to Antarctica, the central plains of Asia, the middle of Australia – now Geraldine McCaughrean takes us to one of the harshest – but beautiful – landscapes – the islands of St Kilda on the edge of the Outer Hebrides. We join Quilliam and a group of boys – all younger than him – with three adults as they set off for the Warrior Stac. They are going on the annual cull of the seabirds who roost there every summer and whose feathers, oil and flesh are vital for the islanders. They will be there, marooned, for a couple of weeks. But what happens when no boat comes to collect them? And why? McCaughrean bases her story on a real incident that took place in 1782. But she is not just writing history. She takes the bones of the event and then asks ‘what if’ and ‘what would it be like’. It is not an easy story but it is completely absorbing. Her characters are not boys from the 21st century transported to the past; they are from their own period, their own culture – and their attitudes, reactions and beliefs stem from that. Nor is it a cosy Robinsonade. McCaughrean excels as always is in her creation of the landscape. Her prose is as hard and as uncompromising as the granite rock of the Stac jutting out of the wild Atlantic. Her descriptions are concise and arresting. 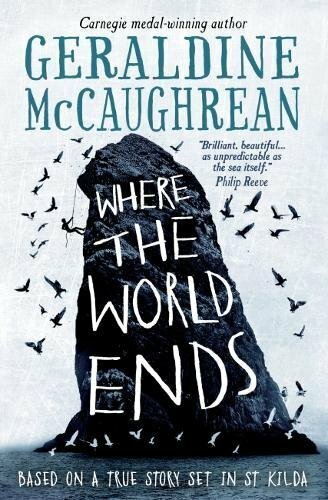 McCaughrean is always worth reading and this is no exception. This is a book to recommend to young readers who want a challenge.